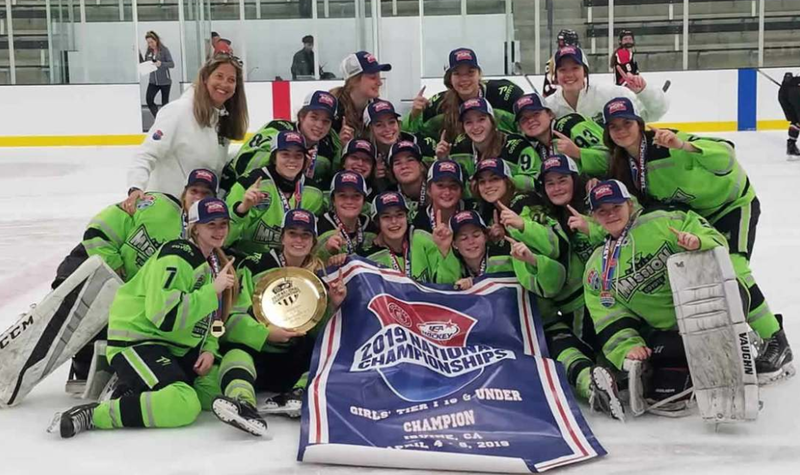 AHAI is excited to announce that the 2018 defending National Champions, Chicago Mission Girls 16U, shut out Rochester Youth Hockey 2-0 in Irvine, California, on Monday, April 8 to earn the 2019 USA Hockey Tier I Girls 16U National Championship title. Although the Highland Park Falcons 16U team put forth a valiant effort in their championship tilt, they ultimately lost to Cheektowaga Hockey (4-5) in a shootout in Plano, Texas, claiming 2nd place in USA Hockey’s Youth Tier II 16U National Championship. There were a total of 11 Illinois teams competing for National Championship titles this year – 3 Tier I Youth teams (Chicago Mission 14U, Chicago Mission 15s, and Chicago Mission 16U), 4 Tier I Girls teams (Chicago Mission 14U, Chicago Young Americans 14U, Chicago Mission 16U, and Chicago Mission 19U), 3 Tier II Youth teams (Chicago Hawks 14U, Highland Park Falcons 16U and Geneva Cyclones 18U) and 1 Tier II Girls team (Northshore Warhawks 14U). Nine (9) out of eleven (11) teams advanced out of pool play and into the quarterfinals in their respective divisions: the Chicago Young Americans 14U Girls, Chicago Mission 14U Girls, Chicago Mission 16U Girls, Chicago Mission 19U Girls, Chicago Mission 15s, Northshore Warhawks 14U Girls, Chicago Hawks 14U, Highland Park Falcons 16U and Geneva Cyclones 18U teams. Six (6) of out nine (9) Illinois teams bested their quarterfinal opponents to advance to their semifinal rounds: the Chicago Mission 14U Girls, Chicago Mission 16U Girls, Chicago Mission 19U Girls, Chicago Mission 15s, Highland Park Falcons 16U and the Geneva Cyclones 18U teams. After the semifinal dust settled, only two Illinois teams remained to battle for a National Championship title: the Chicago Mission 16U Girls and the Highland Park Falcons 16U teams. Overall our Illinois teams had a winning record of 37-13. 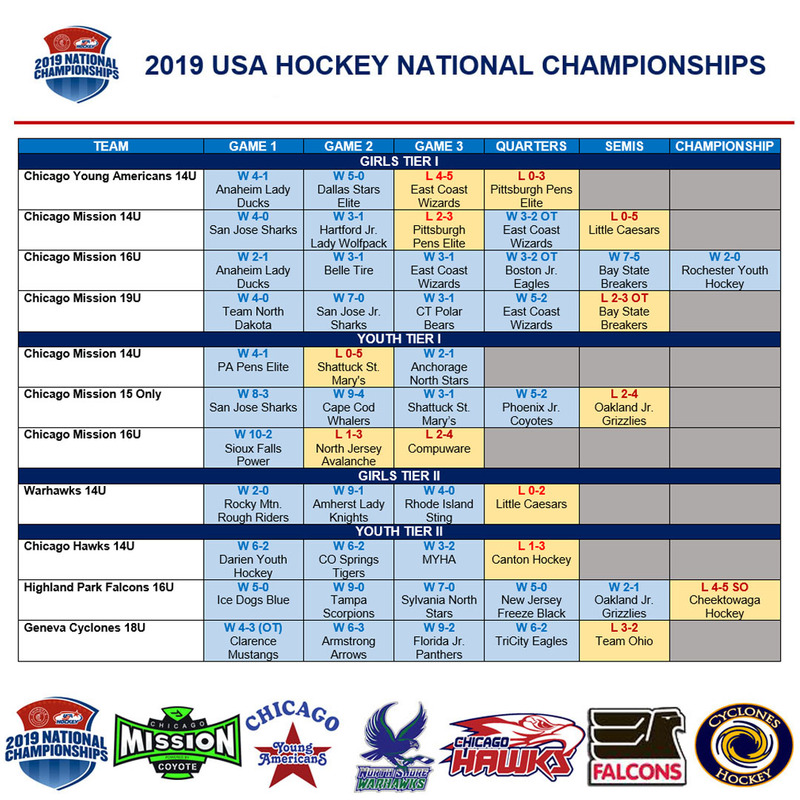 Check out the spreadsheet below for a full recap of the 2019 USA Hockey Nationals. AHAI is incredibly proud of not only our Girls Tier I 16U National Champions, but of ALL our teams participating in USA Hockey’s National Championships!